The disparity couldn’t be ignored, the performance uncharacteristic. While the 76ers’ missing 22 of 25 3-point shots wasn’t the only reason things didn’t go their way in Game 1 of the Eastern Conference Quarterfinals, it certainly was a contributing factor, and a significant one at that. The general consensus among the club, from the head coach to its players, is that regardless of whatever other adjustments they might or might not be able to make moving forward in their best-of-seven series against the Brooklyn Nets, at the very least the shots - simply based on averages alone - will fall. The Sixers ended the regular season eighth in the NBA in 3-point percentage (35.9%), and only 17 times previously during Brett Brown’s six-year coaching tenure (497 games) had the team hit three 3-pointers or fewer. Upon reviewing the film from Saturday’s 111-102 loss, Brown felt opportunities were there. 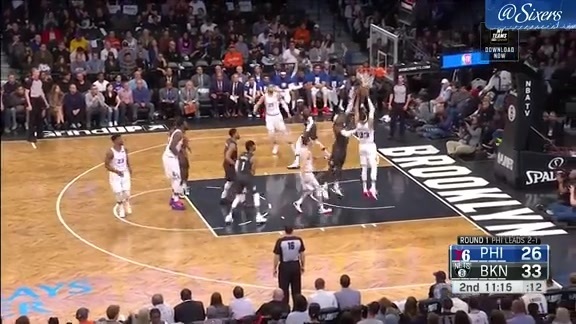 According to stats.nba.com, Brooklyn contested 15 of the Sixers’ 25 3-point attempts. In particular, the Nets (quite understandably) were on alert for JJ Redick and Tobias Harris. Redick, a 39.7% 3-point shooter during the regular season (240 3fgm), was hounded routinely Saturday by Spencer Dinwiddie, and finished 1 for 4 from 3-point territory. Harris, who coincidentally converted 39.7% of his regular season 3-point attempts as well, went 0 for 2 from deep, with DeMarre Carroll doing a solid job of playing him tight. Mike Scott, meanwhile, sunk only one of his eight 3-point tries Saturday after depositing over 40.0% of his regular season threes. In Game 1 for the Sixers, 3-point shooting wasn’t only a theme that reared its head on the offensive end of the floor. Defensively, they saw Brooklyn connect on 11 of 26 tries from distance (42.3%). Nevertheless, there were some positive takeaways. The Sixers held the Nets to 3 for 11 shooting from beyond the arc in the second half, and limited Brooklyn to nearly 10 3-point attempts per 100 possessions fewer than the Nets generated during the regular season. Those are numbers to build upon. Brown remains confident that on both ends, with some minor tweaks, the plan the Sixers brought into their opening-round match-up with the Nets should prevail. What happens at the 3-point line is a big part of that.